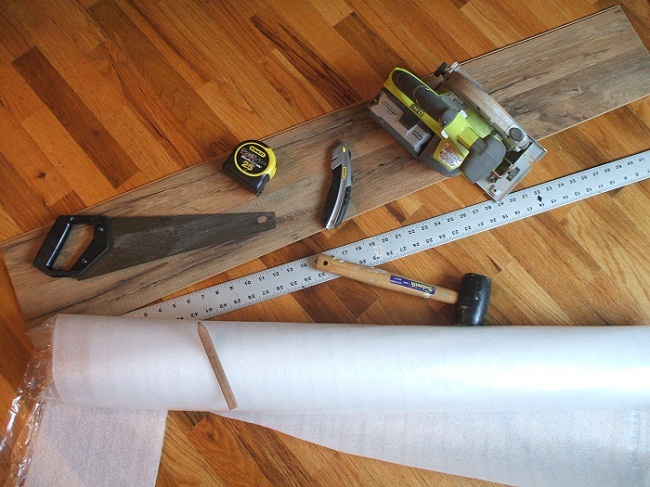 Today we’re going to give you Shaw wood flooring installation guide. As you may already know, there are three types of Shaw wood offered. These wood flooring includes solid hardwood, engineered hardwood, and epic engineered hardwood. Shaw solid hardwood is made from one piece of wood, while the engineered hardwood is made by pressing several different wood layers with heat, and the epic engineered hardwood is made from recycled materials, with the same technique as the engineered hardwood. The benefit of solid hardwood is that with proper care, it can last for generations. However, it is not suitable for a humid place, for instance the upper ground and lower ground floors. On the other hands, the epic and engineered hardwood can withstand moisture better, and they can be installed both in upper ground and lower ground floors. However, the durability is not as high as solid hardwood. The ideal condition to install Shaw wood flooring is to have the floor structure smooth and clean from debris. To get this condition, first you need to examine whether there are nails or staples left behind. Remove them carefully. Then you should vacuum, sweep and wash the floor. Wait until the floor is completely dry. Tar paper is one of the ways to prevent moisture to ruin your wood flooring. It acts as a moisture barrier, and prevents condensation from the floor. Prepare a staple gun and spread the tar paper in the whole room. Staple them and make sure you do it as neat as possible. Unless you are using solid hardwood, always open all of the planks out of the box. Engineered hardwood sometimes has different tone in different box. You don’t want to have a mismatched floor, right? What I usually do is to open them all, and mix them all up. Alternatively, you can also visualize the look by placing them side by side in your room. The second option offers a better result, but longer execution. After you prepare the planks, here comes the installation. First we would like to recommend you to pick random plank length to create staggered seams. Almost all of the planks are has tongue and groove sides so that they can slide right together. Place the tongue side against the wall, and start by installing one row in your longest wall of the room. Staple the groove side with 45 degree angle, and use the staple every 5 to 8 inches. During the last or two planks, you may have trouble setting up the staple. Use finish nail with 90 degree angle. Add some hammer to it so that the nail heads doesn’t hurt anybody. The last thing to do is to hide the seams between the floor and the wall. Usually I use a baseboard to the bottom of the wall. I simply use the finish nailer and voila! It’s done! Remember to paint the baseboard beforehand. There you go, our Shaw wood flooring installation guide.